If you want to study the Bible utilizing the best resources, whether as a pastor, theologian, biblical scholar, or in some other ministry capacity, or simply for your own understanding and growth, there are some amazing tools available today for use on the computer, smart phones, and tablets. In a separate article I discussed a number of completely free programs, apps, and online study tools that have much to offer. One of these, the STEP Bible (https://www.stepbible.org/), in my estimation stands out from the rest because of the completeness of its resources for studying the Bible in the original languages and doing complex, accurate searches on words and phrases in the Bible. If you cannot afford to spend money on a commercial Bible study program, I highly recommend the STEP Bible. Having said that, there are several software programs designed for professional-level study of the Bible that are well worth the expense for those who can afford them. Even if you have no formal training in the biblical languages, any of these programs would be immensely helpful (and perhaps even invaluable if you are in the midst of studying the languages). This article provides descriptions of the commercial Bible study software programs with information current as of July 2016. The descriptions draw on the information provided on these resources’ websites, so that some of the wording used here comes from those sites, but along the way I have also given my own explanations, comments, and evaluations. The original contribution here is mainly the work of bringing this information together from such varied sources, summarizing what is typically spread throughout many pages and even videos from each resource’s website, and providing the information in a way that makes it relatively painless to compare their features. At the end of this article, I will draw some comparisons among the products and offer my opinions. The main three programs to be discussed are Accordance, BibleWorks, and Logos. These programs all do much more than the free programs, apps, and websites, and what they do they also do very well. I have also included information on two other commercial products, PC Study Bible (BibleSoft) and PocketBible (Laridian), that are not as widely used or as highly regarded in professional biblical studies. Since I have not personally used these other products, I am simply passing on information from their websites. An older product that is no longer usable, Gramcord, was at one time a premier program for doing word searches taking into account grammatical elements; the name stood for Grammatical Concordance. The program’s website is still online, but there is no support and the program does not operate on more recent operating systems. It is mentioned here because one still encounters references in older literature to searches done using Gramcord. One of the “big three” commercial Bible study software programs, along with BibleWorks and Logos. For years a Mac-based program, Accordance is now available for Windows as well as iPhone and iPad. It brings into those environments the same user-friendly and inviting look and feel of the Mac program. By all accounts it is the most visually appealing of the three major programs. The program makes complex word searches relatively easy, featuring “flex search” and “exact search” options. Multiple panes can be opened with commentary, outline, cross-references, original-language text, and apparatus (for studying textual variants in the manuscripts), and the panes can be reorganized and resized. As you read through a biblical text, all of the other panes will scroll in sync by verse reference. 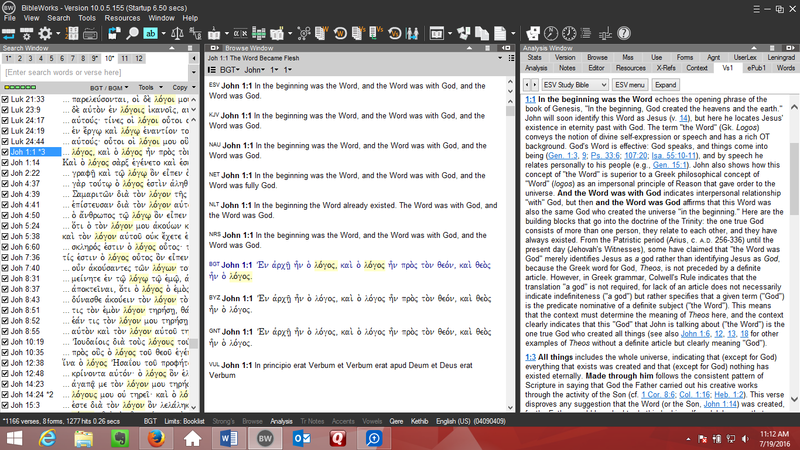 You can add your personal notes to any biblical text or to any other book in your Accordance library. All tools or resources are organized into 23 predefined categories (dictionaries, commentaries, lexicons, grammars, study Bibles, theological, history, apparatus, journals, rabbinic, etc.) that are customizable and to which new categories can be added. There are five tiers ranging from the Starter to the Ultimate packages; all but the Starter may be purchased in installments, and there are a variety of discounts available including those for full-time students and ministry workers. If you want to study the biblical texts in a serious way you will need at least the Original Languages package ($299), which includes most of the Greek and Hebrew biblical texts and reference works one should have. The Advanced package is considerably more expensive ($999); it comes with an interactive atlas that can be customized and maps that can be viewed in 3D, along with the Pillar NT Commentary series and most of the volumes in the highly useful IVP reference collection. The Ultimate package ($1,999) also includes important ancient extrabiblical writings in Greek (Pseudepigrapha, Philo, Josephus, and the Apostolic Fathers), the premier biblical lexicons HALOT and BDAG, and several excellent commentary series (NIGTC, Tyndale, Holman, and New American). Hundreds of additional books and other types of resources are available for purchase individually or in bundles. Accordance is recommended by some prominent biblical scholars, including Darrell Bock, James Charlesworth, Craig Evans, William Mounce, Emanuel Tov, and Daniel Wallace. BibleSoft is a strictly commercial product, and unfortunately there are essentially no previews or videos showing how the product works (I found one short video from 2010). Originally known as the PC Study Bible, the software is now available for PC (the OneTouch PC Study Bible), Mac alone, or in a Mac/PC bundle. The OneTouch PC Study Bible (for Windows) is available in three packages ranging from $188 to $1,200. All of them feature tools called Smart Search, Smart Tools, and Smart Links. Smart Links provides a table of contents to all of the resources containing a particular biblical reference. Tools include study notes, topic, library, Bible, books, and commentary. The mid-range Discipleship Series edition ($640) includes the KJV, NASB, Lexham, and Goodspeed’s NT; public-domain commentaries and notes (Gill, Darby, Ironside, Scofield, Goodspeed, Trench, Keil & Delitzsch, et. al. ), three other books by Goodspeed, and the Evangelical Dictionary of Biblical Theology; several Greek reference works including the abridged Liddell & Scott lexicon, Abbott-Smith’s grammar, Moulton & Milligan’s grammar, and Burton’s Syntax; the Leningrad Codex and the SBL Greek NT; the OT Pseudepigrapha (in English); the Holman Bible Atlas; and miscellaneous books. The Mac Study Bible packages cost $90, $250, and $600, while the Mac/PC bundle packages cost $155, $430, and $1,000. The interface is the same as the PC Study Bible. It features SmartView, utilizing databases for Greek, Hebrew, and Aramaic. The mid-range Complete Reference Library includes several English versions (ASV, Douay, ESV, KJV with Apocrypha, NASB, NET, NIV, NKJV, and NLT); BHS and NA27, which are standard Hebrew OT and Greek NT texts; the Hebrew lexicon BDB (abridged and unabridged) and Thayer’s Greek lexicon; Strong’s dictionaries; Josephus in English; the Bible Knowledge Commentary, IVP Bible Background Commentary NT, Keil & Delitzsch, and several public-domain commentaries; the old ISBE; Hard Sayings of the Bible; Moody Atlas of Bible Lands and other maps and photos; a fairly impressive collection of theological literature (e.g., creeds, Owen, Edwards, early church fathers, Calvin’s Institutes, Aquinas’s Summa Theologiae); and other mostly older works. The high-range Professional Reference Library ($1,000) adds the HCSB and NRSV, the Robinson, Scrivener, Stephanus, Tischendorf, and WH Greek texts, the Leningrad Codex, Louw & Nida’s lexicon, Calvin’s commentaries, the IVP Bible Background Commentary OT, the new ISBE, Robertson’s Word Pictures, the UBS Handbook series for both OT and NT (41 volumes), Metzger’s Textual Commentary, the 3-volume Exegetical Dictionary of the NT, the 10-volume TDNT, and the Pocket Dictionaries for Greek and Hebrew. There is also a BibleSoft app (http://www.biblesoftonline.com/) that can be used in a browser or in iOS or Android devices. The basic app is free, while the more fully featured versions require a monthly subscription of $4, $6, or $10. All of the subscription-based versions allow you access from any computer or device. You can create notes in Microsoft Word without leaving the program, and keep unlimited highlighting, bookmarking, and notes. The high-end version comes with several English versions; the Westminster Leningrad and TR biblical texts (no LXX text and no other NT Greek text); Strong’s, BDB, and Thayer’s; and mostly public-domain commentaries, notes, and theological literature similar to the PC Study Bible. Most academically oriented of the major software products, known for its emphasis on the biblical languages. Unlike Accordance and Logos, BibleWorks comes in just one package, though add-on modules can be purchased. The program is entirely Windows-based and is not available as an app, although it can be used on a Mac with an installer or other workaround, and it can be used on Windows-based tablets. The base price of $389 is the least expensive option for those wanting access to the biblical texts in multiple ancient and modern languages as well as language study tools. That is because the singular focus of this software is on the biblical texts and ancient primary sources, and there is very little in the way of secondary literature (the main attraction of Logos, by contrast). The regular package includes long lists of Bible texts in the original languages, Latin, and in nearly 40 modern languages, along with many lexical and grammatical reference works. The package also includes the OT Pseudepigrapha, the works of Josephus and Philo in Greek and English, the early church fathers, the old ISBE, the NT Apocrypha (in English), Archer’s OT Quotations in the NT, and several Protestant confessions, among other resources. The original-language texts come with lexical and grammatical information; you can hover the mouse over a word to get instant information about it. Access critical apparatus, study Bible notes, etc. Search for words, partial words, and phrases; perform “fuzzy” searches; do searches on specific grammatical and semantic elements. Dictionaries and lexicons are also searchable. Automatic highlighting shows differences in a text between multiple versions. You can type in Greek, Hebrew, or your modern language. Copy and paste or drag and drop verse text to other programs. There is a diagramming module that fully diagrams Greek NT texts and that allows the user to construct one’s own diagrams. Comes with high-resolution images of several major biblical codices. Read unlocked EPUB ebooks and organize them by category. Organize your own links from BibleWorks to Internet resources and other Bible software. Align Hebrew and Greek texts to make comparisons easy. Dozens of pre-made satellite maps that can be customized with time periods, sites, and notations. Limit searches to specific books or sections of the Bible. See parallel accounts in the Gospels in the Synopsis Window. Find the most frequently used words for any range of verses. Create your own notes that load each time you view a verse or word in the Bible. BibleWorks is endorsed by several highly respected NT scholars, including Thomas Schreiner, Moisés Silva, David A. deSilva, Joel B. Green, and Jan van der Watt. Software for PC, Mac, iPhone, iPad, Android, and Windows phone/tablet. Software is free and comes with some resources, but a serious Bible student will want one of its library collections, which range in price from $60 to $330. The “platinum edition” for $330 has a good selection of English versions and the SBL edition of the Greek NT; if it includes a Hebrew text for the OT the website does not list it. Apparently it comes with no Greek or Hebrew language tools except Strong’s dictionaries, which are quite inadequate. The one impressive feature in the platinum edition is the inclusion of a large number of IVP reference works including three of its large biblical dictionaries, the Pocket Dictionary series, the New Dictionary of Theology and the New Dictionary of Biblical Theology, and the IVP Bible Background Commentary (OT and NT). Logos is one of many products produced by FaithLife (https://faithlife.com/about) that integrate with one another. In a separate article on Bible reading tools, I discussed two of those products—Biblia.com and the FaithLife Study Bible. Logos is one of the big three commercial Bible study software programs (the other two being BibleWorks and Accordance) and the one with the widest appeal, especially designed for pastors. Logos (https://www.logos.com/) is available for both Windows and Mac, and it integrates with FaithLife’s free study Bible app for most mobile devices. Logos has many good features and enables the user to do many different things of help in studying the Bible. You can study the Greek and Hebrew text, including textual variants, word meanings, and sentence structures; learn about the cultural, literary, historical, and geographical contexts; and read what ancient and modern interpreters have said about a passage. You can also produce presentations while studying the text. The Logos Core Engine is free and allows the user to make use of free resources as well as individually purchases items. The eight standard base packages run from just under $300 (241 resources) to over $10,000 (5,001 resources), and can be financed with monthly payments. The least expensive, “Starter” base package includes data on biblical events, people, places, and things; interactive media on various topics; timelines; ten English Bibles; interlinears; the Greek NT SBL Edition; harmonies; OT allusions and quotations in the NT; three study Bibles; several commentaries; Bible dictionaries and encyclopedias; Greek and Hebrew lexicons; atlases and related resources; three older systematic theology textbooks; several classic works; three reference works on apologetics; and more. Each successive base package adds substantially more resources, most notably whole multi-volume commentary series (and it is possible to purchase a base package and later upgrade). There are also denominationally specific base packages for Anglicans, Baptists, Lutherans, Methodists/Wesleyans, Pentecostals/Charismatics, Orthodox, Reformed, Seventh-day Adventists, and a special set of base packages called Verbum for Catholics. Logos also provides theological education courses from notable evangelical professors (called Logos Mobile Ed). Occasionally these base packages go on sale for 10% off (one such sale just ended, unfortunately). In order to have most of the important ancient language texts and linguistic reference works that a biblical scholar would want, you would want one of the mid-range packages (Silver, Gold, or Platinum) that cost between roughly $1000 and $2000, with monthly installment plans that will run around $75 to $120 a month (for some 8 to 20 months or so, depending on the plan), give or take. Logos is recommended by John Piper, Tim Keller, John MacArthur, Josh McDowell, Craig Evans (who has also endorsed Accordance), and others. You might also take a look at Noet (https://noet.com/), a suite of tools and texts for studies in the humanities, especially classical studies, philosophy, history, and literature. Noet and Logos are produced by the same company and fully integrate with one another. Although I cannot definitively evaluate BibleSoft’s software and app or Laridian’s PocketBible, I can state with some confidence that they are not in the same league as the other three products reviewed here. Anyone considering purchasing one of those products would most likely be better served investing in one of the other three products—Accordance, BibleWorks, or Logos. All three of these products are excellent and I am not going to suggest that one is better than the others for all users. 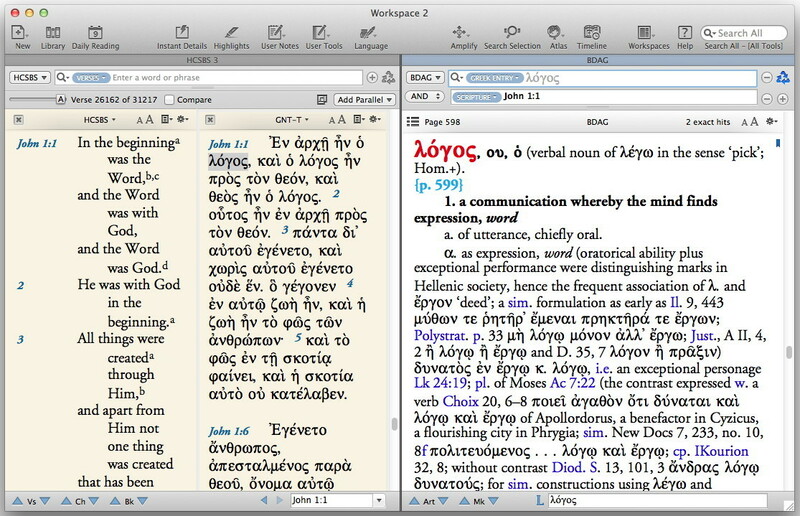 For those who just want a program to do complex research in the original-language texts, BibleWorks may be the best choice, especially if you use a PC (I don’t know how well BibleWorks does on the Mac, which requires a special installer). Accordance is a strong alternative; it was Mac-only for years but is now available on the PC as well, and by all accounts it works well on both. Accordance should be especially of interest to those who want a program that is fairly strong in the original-language texts but for less than the cost of BibleWorks (the Original Languages package costs about $300). I have been using BibleWorks for maybe fifteen years and it has been invaluable. The only thing I really wanted or expected in a Bible study software program was to be able to do a variety of simple and complex searches in the original-language texts, look up lexical and grammatical information, compare texts in multiple translations, and the like. I also didn’t expect access to the program on my phone (! ), so the lack of an app hasn’t been an issue for me. With the recent advances in handheld devices and the explosion of digital and internet resources for biblical studies, however, I have been taking a fresh look at the available programs. If you want your Bible study tool to “do it all,” both Accordance and Logos are excellent options. You can have either of these programs on your PC or Mac computer, tablet, and phone. Both enable complex word searches and provide important exegetical tools and commentaries. In addition, Logos provides especially rich resources for background studies—cultural elements, maps, images, and the like. In effect, Logos is also presentation software built right into your Bible study program that makes it easy to produce visual presentations for use in classes or sermons. You can even keep your prayer journal in Logos. It is also a community with its own biblical education courses, blogs, news, and more. Logos is thus much more than a Bible study software program. Even if you decide not to purchase one of its base packages, you can get the Logos “engine” free, which allows you to become part of the Logos community, get free and inexpensive books as they become available, and use its study Bible and other free resources. Accordance, BibleWorks, Bible Parser, Logos: speed test! Just what it sounds like; has blogged about BibleWorks, e-Sword, Laridian, Logos, Olive Tree, and other Bible software and online tools. Kielsmeier-Jones, Abram. “Which Bible software program should I buy? Comparison of BibleWorks, Accordance, and Logos.” Words on the Word (blog), 12 Nov. 2012. Bible professor and Accordance staffer’s blog, often discussing other programs such as BibleWorks, Logos, and Olive Tree.